Bestselling author Lori Copeland shares another marvelous romantic Western full of God's grace, the beauty of redemption, and second chances. Famous bounty hunter Cade Kolby is forced off the trail to decide the fate of his late sister's orphaned children. He's not just returning to his hometown and nieces and nephews, but also to the fiery redhead he loved and left 17 years ago. The last person Zoe Bradshaw wants to see is Cade. She tries to be cool and polite, even as the attraction between them flares up again. 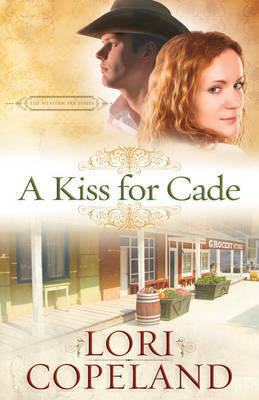 Only this time, Zoe is determined to not let Cade get close to her heart. But the townsfolk have other ideas. They want to see the little orphans with a mother and a father, and they form a plan that includes the possibility of a kiss...This was formerly titled "The Courtship of Cade Kolby", rewritten for the inspirational market. Lori Copeland is the author of more than 90 titles, both historical and contemporary fiction. With more than 3 million copies of her books in print, she has developed a loyal following among her rapidly growing fans in the inspirational market. She has been honored with the Romantic Times Reviewer's Choice Award, The Holt Medallion, and Walden Books' Best Seller award. In 2000, Lori was inducted into the Missouri Writers Hall of Fame. She lives in the beautiful Ozarks with her husband, Lance, and their three children and seven grandchildren.